Two Marines were rescued. One of them is in stable condition, Japan’s defence ministry says. The condition of the other one was not immediately known. The Marine Corps has not officially confirmed this. It tweeted that the incident occurred at about 02:00 on Thursday (17:00 GMT Wednesday). There were five personnel on the C-130 and two on the F-18. The US planes had taken off from Marine Corps Air Station Iwakuni and “were conducting regularly scheduled training when the mishap occurred”. 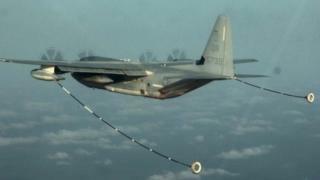 The BBC’s Rupert Wingfield-Hayes in Tokyo says that air-to-air refuelling is a difficult and potentially dangerous flight operation, especially when done at night. He says it is not clear what the weather conditions were like but overnight there was widespread cloud and rain across the Japanese archipelago. The KC-130 is an extended-range tanker version of the C-130 and is used for mid-air refuelling. The McDonnell Douglas F/A-18 Hornet is a fighter and attack aircraft and can carry a wide range of missiles and bombs. The US has more than 50,000 troops stationed in Japan, more than 18,000 of them in the US Marine Corps. The US has had problems with reliability of its aircraft in Japan. In November an F/A-18 Hornet crashed into the sea south of Okinawa. The two pilots ejected and were rescued. Last December part of a US helicopter crashed on to a school in Okinawa, renewing tensions with the local population. Over the past years, a number of accidents and crimes have led to growing local opposition to the US base there.